“If given permission to collect our own taxes, we could do it much less expensively and save taxpayers hundreds of thousands of dollars,” Fromson said. But Haverstraw Town Supervisor Howard Phillips said the fee collected by his town was vital in maintaining the integrity of the tax roll. That money goes into funding the town tax receiver’s office and costs related to determining and defending the value of the town’s assessed property against challenges. This involves the town assessor, town attorney and assessment consultants, he said. “The people who want this to be removed, they think that money just disappears,” Phillips said. “It doesn’t. The town will have to raise the money on their town taxes. Phillips noted that the the school district is the biggest benefactor from the town’s efforts to maintain the value of its assessed property. “The 1 percent figure that’s in place for the town of Ramapo and the town of Haverstraw was significantly higher than virtually every other jurisdiction we found,” Fromson said. The Ramapo Central school district administration building in Hillburn. “The taxpayers have a right to know to whom their money is going and for what it’s being spent,” Fromson added. Peggy Zugibe, area representative of the New York State School Boards Association, said she agreed with the association’s position in support of the proposed law. “I believe it offers the taxpayer transparency as to where their tax dollars are going,” Zugibe said. “I think people deserve to be able to follow their tax dollar. 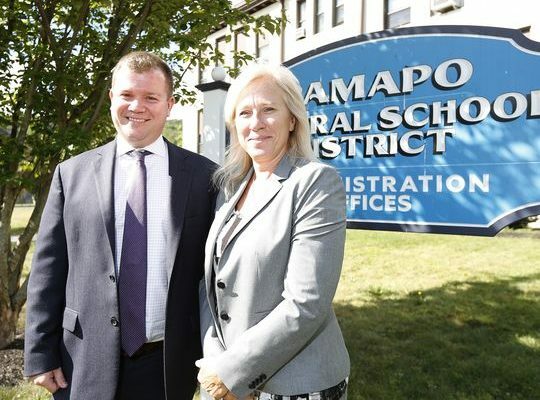 The Ramapo Teachers Association has come out in support of the law as a means of “eliminating a towns’ ability to exploit taxpayers,” according to a letter sent to The Journal News.